The celebrities slayed the red carpet in their best attires. We will leave it to you to decide how they looked. The Lux Golden Rose Awards were held on Sunday night (November 18) and surely it was a star-studded event. It was attended by B-town celebrities, including actors Shah Rukh Khan, Hema Malini, Zeenat Aman, Akshay Kumar, and Kareena Kapoor Khan, among others. The evening also saw a sizzling performance by Dhadak pair Janhvi Kapoor and Ishaan Khatter who danced on their hits like Dhadak, Jugni, Kar Har Maidan Fateh and Zingaat. She opted for a strapless sequined metallic gown with a mermaid trail. She styled her gown look with soft curls over her shoulder with minimal makeup. The gorgeous diva, Aishwarya Rai Bachchan, wore a full-sleeve gown and was head-to-toe in red. The gown was full of sequins and mirror work. She kept her hair straight and added red bold lipstick to round off her look. 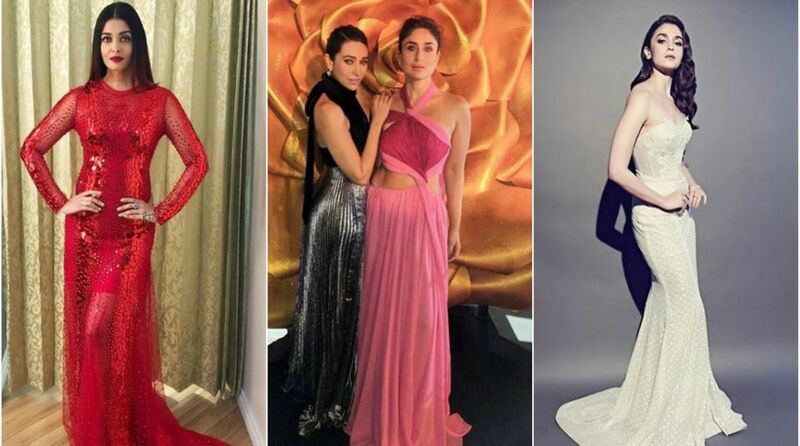 Kareena added grace to the red carpet in a dual coloured gown. The red and pink gown with cutouts and thigh-high slit was just perfect. She tied her hair in a bun and did minimal makeup to complete her red carpet look. Madhuri wore a custom-made pink gown and we loved the long cape sleeves which was the highlight of her outfit. She added accessories to her look and kept her hair in wavy texture. Janhvi Kapoor also opted for a bridal gown like Alia Bhatt. She styled her hair in a bun with floral pins and soft curls. With minimal makeup, she looked absolutely stunning for her red carpet look. Miss World 2017 Manushi Chillar turned heads with her stunning attire at the red carpet. She chose a golden gown with fully sequined work. To complete her look, she kept her hair straight and did minimal makeup. Karisma chose a halter neck gown with an open back, pairing it with a silver pleated skirt. She completed her look with a back bun and soft smokey eyes and statement earrings.